Gospel tenor singer Sherrill (Shaun) Nielsen recently passed away after a courageous battle with lung cancer on Friday, December 10th, at the age of 68. In this touching interview Donnie Sumner remembers his late friend Sherrill Nielsen - Elvis’ Favorite Singer. Sherrill Nielsen was an established anchor in the gospel music world, having been a member of Jake Hess & The Imperials, Hovie Lister & The Statesmen, and The Singing Speer Family. The Gospel Music Hall of Fame subsequently inducted Nielsen three times for his work with the previously-mentioned groups. The late singer devoted his life to singing and spreading the good news of his Christian faith, calling Denmark home for much of the '90s and '00s. Rock and roll fans might remember him a bit differently, though, as Nielsen sang back-up vocals for Elvis Presley, beginning in 1973. Elvis’ record producer, Felton Jarvis, is on record as saying that Elvis considered Nielsen his favorite singer. 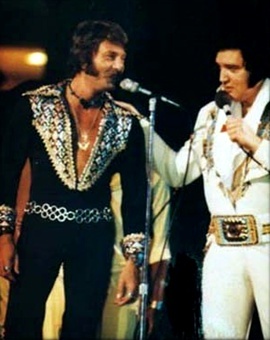 As a member of Voice, one of Elvis' backing vocal groups onstage and in the studio, Nielsen remained with Elvis until the end, becoming a close friend. Elvis would often ask Sherrill to take the spotlight and perform "Walk With Me," "Help Me," "Unchained Melody" (check out the ending), and "Spanish Eyes." In addition, two fine duets were recorded in concert, namely "O Sole Mio/It's Now Or Never"(Nielsen sang the Italian portion of this million seller) and "Softly, As I Leave You," with the latter receiving a Grammy nomination when released posthumously in 1978. To commemorate the passing of Nielsen, his friend Donnie Sumner graciously agreed to be interviewed. Sumner is the nephew of the late, great J.D. Sumner, the lowest bass singer on record, and he was the lead singer and arranger of J. D. Sumner & The Stamps Quartet, who famously backed Elvis from 1971--1977. Interview by Jeremy Roberts a Pop Culture examiner and a graduate of the University of Georgia who contributes to Examiner.com. (Click here for more Jeremy Roberts Articles) . Donnie Sumner can be seen throughout Elvis: Aloha From Hawaii, and he also sang an impassioned version of "The Lighthouse" in the 1972 documentary, Elvis On Tour (for Elvis fans fortunate enough to attend Elvis Week 2010 in Memphis back in August, it was a moment to remember as he sang this song, receiving a standing ovation). He is also all over Moody Blue, Elvis’ final studio LP released during his lifetime. When Donnie resigned from The Stamps in 1973, he was soon asked by Elvis to rejoin him. Along with Tim Baty and Nielsen, a new vocal group was born, Voice. Elvis took the rare step of drawing up a contract for Voice, and they often sang nonstop in Elvis' suite after shows. They sang on a number of Elvis' hit singles, including "Promised Land," "If You Talk In Your Sleep," "My Boy," and the barn-burner "T-R-O-U-B-L-E."
Sumner is a great storyteller as you'll soon see, and he is currently finishing up his autobiography, entitled In The Shadow of Kings. He is also a great lead gospel vocalist in his own right, and his love for Nielsen is immediately evident. 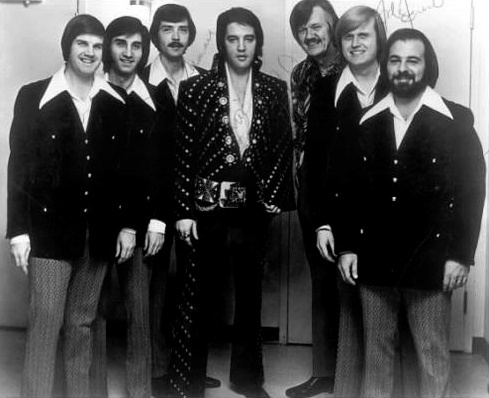 Left To Right: Bill Baize, future Oak Ridge Boy Richard Sterban, Donnie Sumner, Elvis, J.D. Sumner, Ed Enoch, and Nick Bruno. Q: How did you and Sherrill first meet? Donnie Sumner: I first met Sherrill in 1965; he was with Jake Hess & The Imperials, and I was with J.D. Sumner & The Stamps Quartet. I had seen him with The Speer Family earlier, but I never met him until I joined The Stamps. Q:How would you describe Sherrill's personality and character? DS: Sherrill was a fun person to be with, and he loved to laugh. I always found him to be a real gentleman and very courteous to everybody. We talked a lot about life and family, so we basically fit into the big scheme of things. Q: What were the circumstances behind Sherrill joining Elvis' band? DS: Sherrill had just left The Statesmen Quartet, and I had just left The Stamps. We got together to make some music and wound up with The Tennessee Rangers. At Elvis’ request, we were flown to Vegas to sing backup on the Tom Jones show, and at the end of that engagement, Elvis signed the three voices: Sherrill, Tim Baty, and I to be his personal gospel group, and he changed our name to Voice (the name comes from a religious periodical Elvis received). Q: What was Sherrill's contribution to Voice and Elvis' overall stage show? DS: Sherrill could hit notes higher than the normal tenor, and Elvis loved for him to sing exceptionally high on the endings of all his stage ballads. 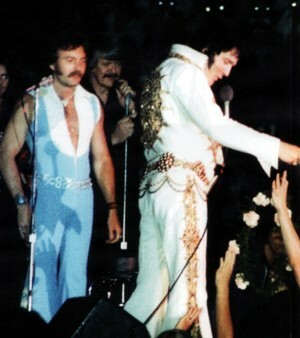 Elvis and Sherrill made an excellent duo ... they seemed to draw inspiration from each other’s ability to perform. 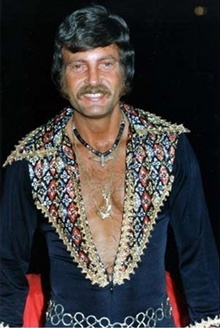 Q: Can you tell us the story about Sherrill getting a hair transplant at Elvis’ Palm Springs home? DS: I sure can. If there were any imperfections in your appearance that bothered you, and money could make it better, you would not have wanted to mention it, even casually, in the presence of Elvis, or you would be the recipient of a large-scale surprise. Shortly after becoming part of the "Elvis family," in September 1973 we found ourselves in Elvis’ living room. Different guys, including Rick Stanley, Charlie Hodge, Joe Esposito, and Sonny & Red West began to pick out the flaws of other various group members in a joking manner. 'Voice' was freshly adopted into the family, and by reason of our shortness of tenure, I suppose we felt a little uneasy kidding the long standing members and therefore had made no overtures at that point. Elvis, keenly aware as he always was, realized that neither of us three had joined in, and with a big laugh he said, "I guess the only ones perfect in here are Voice and me!" Sherrill giggled and replied, "I keep all mine covered up." Elvis asked, "Whatcha' covering up, man? You look okay to me." Sherrill smiled and responded, "Well, my hair's a little thin on the top, and I have to comb it up from the sides to cover it up." Pointing to his upper middle teeth, Sherrill then said, "I've always had this tiny space here between my teeth, so I just don't smile too big and not many people notice it." The subject changed as the evening continued. However, by the next morning things were about to change in a big way. Voice was staying at a nearby motel, and I was awakened by a call from Red West. He said, "Elvis wants you and Sherrill up here as quick as you can get here!" As was my habit, when I was beckoned by Elvis, I said, "O.K.! Be right there!" Once Sherrill and I arrived, Elvis saw us and said, "Hey guys, I want you to meet my friend Dr. Shapiro. He’s gonna fix that space between your teeth!" Personally, I would have gone to pieces because I have to take at least a couple of days to get psyched up for a dental appointment. Not so with Sherrill. He walked over to the couch, said nothing, sat down, and prepared himself as though he was about to watch a movie. In just a few minutes, Sherrill got up from the couch and smiled. There, for all the world to see, were two beautiful caps, compliments of Elvis. A few hours later, we had eaten lunch and were watching television when the doorbell rang. Red went to the door and invited the short oriental gentleman to enter. Elvis shook his hand and called out, "Hey Sherrill! I got a surprise for you. The doc’s here to give you a hair transplant." I was expecting Sherrill to lose his newly acquired caps; instead, he casually walked into the bedroom and lay face down on the bed. The doctor cut a big hole in one of Elvis' sheets, draped it over Sherrill's body, with his head centered inside the hole. As we watched, the doctor proceeded to remove one hundred small plugs of hair from the back side of Sherrill's head. He then inserted the plugs into one hundred small holes he had previously made in the top of Sherrill’s scalp. After the ordeal, the doctor wrapped Sherrill's entire head, from his eyebrows to the top of his neck, in a huge, thick blanket of gauze. As Sherrill got off the bed and saw himself in the mirror, looking like "The Invisible Man," I strongly suspected he wished that he could reverse his comments from the night before. Q: The next day, Elvis had a quickly arranged recording session at his Palm Springs residence, with one of the highlights being 'Are You Sincere'. If you listen to the end of that record, you can hear Sherrill singing off-key. What were the circumstances leading up to that hilarious moment? DS: Colonel Parker, "The Man," had called Elvis and informed him that due to contractual agreements with RCA Records, Elvis had a given numbers of days to finish the Raised On Rock /For Ol’ Times Sake LP. Elvis’ personal hand-held mike had been stolen at his earlier July 1973 session at Stax Studios in Memphis, and Elvis had left that session in utter disgust. Colonel further relayed to him that he had to return to Los Angeles and begin recording immediately. Although not privy to both ends of the conversation, I did hear Elvis' response. In less than religious language, Elvis said, "Tell those *&^$# so and so's, if they want my voice, they’re gonna have to come down here and get it!" With God, nothing is impossible. With The Colonel, very few things were impossible. Late that afternoon, a huge tractor-trailer truck pulled up in front of Elvis' front door. To the amazement of Elvis, three men jumped out of the truck and began to unload equipment. Within a short time, they had transformed Elvis' living room into a state of the art recording studio. Having had no prior knowledge of the session, Elvis had not chosen a single song nor contracted a solitary musician. With such short notice, Charlie Hodge only managed to obtain Elvis’ guitarist, James Burton, with Voice having to supply bass (I’m on piano), and Charlie on acoustic guitar. After we had assembled in the living room, Elvis took a microphone, and standing on top of the coffee table, he said in a radio announcer’s voice, "Dearly beloved, we are gathered here today in the presence of these witnesses to make a record, and I have one simple question to ask, 'What in the *&^$# are we gonna record!" Then, with a more serious tone, Elvis asked, "Really, what are we gonna sing?" Ultimately, I remember we worked on "I Miss You," a quiet little ballad I wrote, "Sweet Angeline," and "Promised Land." After those songs were cut, Elvis remarked, "Well, if all minds and hearts are clear, let's stand and be dismissed, ‘cause I'm outta songs." We had been making music since early in the afternoon and now it was very late in the post midnight hours. Everyone was tired and to say the least, silly. We still needed one more song to complete the album, and after some debate between Elvis, Red, and Sonny, they eventually came up with the song, "Are You Sincere." We began the intro, and Elvis ran through it a couple of times. Elvis then came up with the idea that he wanted Sherrill to do a short obbligato repeat line of the words "Are You Sincere" at the end of the song. Being in a tremendous amount of pain and discomfort, Sherrill had tried to maintain his composure by indulging in a quantity of painkillers. Though still able to function, Sherrill was in no way capable of maximum performance. Anyway, Sherrill stepped up to the mike and began his beautiful one line solo ending. "Are You Sin" came out with exquisite clarity of both tone and pitch, but when the "Cere" was pronounced, it came out of Sherrill's mouth at least a quarter of a tone flat. Elvis immediately began to laugh hysterically at the note Sherrill had so miserably failed to correctly pitch. After the rush of laughter from all of us had subsided, Sherrill, with his gauze-covered head and his pain killer-numbed body, approached Elvis and said, "I gotta overdub that ending, boss. I really missed it!" Elvis laughed and said, "That's the first time I've ever heard you miss a pitch, and I want the world to hear it just to prove to 'em you're no better singer than I am." Back in L.A., the engineers erased Elvis' laughing seizure at the end, but Sherrill's note remains flat to this day, thanks to Elvis. Q: Does a story come to mind when you think about Voice staying up all night, singing for Elvis? DS: Not any particular story, other than the fact that one night Elvis asked us to sing "In The Sweet By and By" eighteen times, back to back, including all four verses. I don't think Sherrill would have liked to have been asked to sing it for a few days. Q: Thirty-plus years later, what do you remember about being on the road with Elvis & Voice? DS: My fondest memories are just being friends with all the guys and knowing that the friendship I felt for all of them was returned in like manner. Q: For someone who doesn't know who Sherrill is, can you mention a song that you consider his crowning musical achievement? DS: Here’s two: "Walk With Me" with Jake Hess & The Imperials, and "Softly As I Leave You" with Elvis. (Ed. Note: "Walk With Me" first appeared on the 1965 LP, The Happy Sounds of Jake Hess and The Imperials, and it is sadly out-of-print. However, a March 1977 performance of the song at one of Elvis’ shows in Alexandria, Virginia, is available on the YouTube video see below. A December 13th, 1975 Vegas recording of "Softly As I Leave You" was later released as the b-side of "Unchained Melody" in February 1978, garnering Elvis & Sherrill a Grammy nomination for Best Country Vocal Performance. Folks can download "Softly" from the 2001 Elvis box set: Live In Las Vegas). 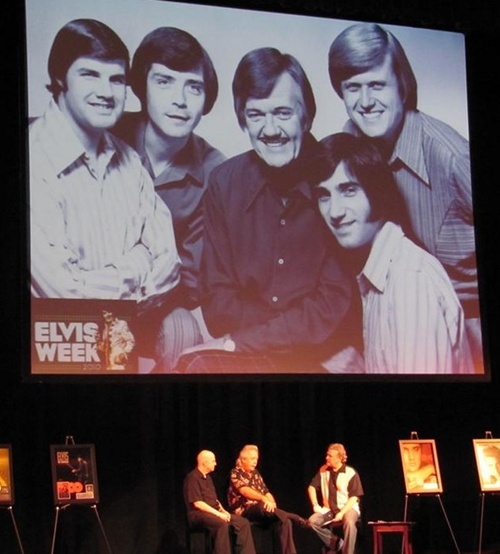 Q: After Elvis passed, did you and Sherrill reunite and sing onstage again? Q: What role did God and faith play in Sherrill's life? DS: Sherrill was committed to his own theology which was basically conservative ... somewhere between the Baptist and the Pentecostal theology. Neither Sherrill nor I were the type to wear our religion on our shirt, but both of us have very deeply rooted values and have never been persuaded to change. Q: When was the last time you spoke with Sherrill? DS: Shortly before he passed away, I called him on the phone to check on him and to let him know that I was praying for him. Surprisingly enough, he was in good spirits and gave me a good report. Sherrill also let me know that he was planning a couple of overseas trips at that time. Q: How would Sherrill like to be remembered? DS: Simply put, as a wonderful husband, a loyal friend to all, and a great singer. Q: Is there anything else you would like to say about Sherrill that we haven't covered? DS: I look forward to singing with him for about a million years at some point. Interview by Jeremy Roberts for EIN. -Copyright EIN February 2011 - DO NOT COPY. 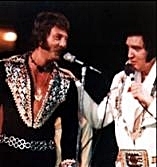 Click here for FULL article - Plus more photos - and LINKs including Sherrill Nielsen singing WALK WITH ME during an Elvis Presley concert on March 30th, 1977, in Alexandria, VA; You can listen as Elvis thanks Sherrill with J.D. Sumner and The Stamps Quartet providing backup vocals. Donnie Sumner and Bill Baize are pictured on Saturday, August 14th, 2010, during Elvis Week, with a classic image of J.D. Sumner and The Stamps Quartet shown above from 1972. Sherrill Nielsen: Famous Southern Gospel Singer and Elvis Presley’s favorite singer, Sherrill (Shaun) Nielsen, went to be with his Lord and Savior on Friday, December 10, 2010. His devoted wife, Brenda Hall Nielsen, was by his side and held his hand as he crossed over the River Jordan. - Sherrill (Shaun) Nielsen, will be flown to the great state of Texas and buried next to Sherrill and Brenda’s only child, SherRee’ Elicia Nielsen, in the Cathedral in the Pines Cemetery, in Tyler, TX. He was born September 10, 1942, in Montgomery, AL to Virginia Evelyn Jackson and Charlie Whitaker. He graduated from Robert E. Lee in Montgomery AL and then onto Trevecca Nazarene College in Nashville, TN. He then proudly served his country serving in the Air Force with the Air Force Strategic Command Band, Omaha, NE. Little did the world know what to expect when Sherrill was born. God gave him one of the most amazing tenor voices around. Sherrill started his singing career at the age of 4 singing in his local Nazarene Church in Montgomery AL, where Mom and Dad Speer attended. Sherrill started his professional music career at the tender age of 14. He won the Mr. America Youth Singer at the Coliseum in Montgomery AL. At age 15, he cut his first solo LP – A Name I Highly Treasure. In 1961, he joined the Singing Speer Family. While with the Singing Speer Family he was inducted into the Gospel Music Hall of Fame. This was the stepping stone for his legendary 50 plus year career in So. Gospel Music. Sherrill teamed up with Jake Hess and formed the Illustrious Imperial Quartet, which won him another induction into the Gospel Music Hall of Fame. Sherrill’s ministry has touched hearts and lives all over the world. He received two Legendary Awards for his dedication to gospel music, a Proclamati on from the Governor of Alabama, and in June 2011 was scheduled to be honored by the Music City Gospel Showcase as “As Pioneer and Legendary Performer”. In March 2010, Sherrill was diagnosed with Lung Cancer. He lived his life with dignity and lived his life to the fullest. Aloha From Oahu, Hawaii - In search of Oahu Elvis. Elvis and the Coal Mine - a tax fraud!